[PRESS RELEASE] – The U.S. Department of Agriculture (USDA) has awarded the California Department of Agriculture (CDFA) and its partners a $3.9 million Food Insecurity Nutrition Incentive (FINI) grant – the largest in the country. FINI grants are designed to increase the purchase of fruits and vegetables among low-income people participating in the Supplemental Nutrition Assistance Program (aka SNAP, formerly food stamps). “We are thrilled to be selected for a federal FINI award,” said CDFA Secretary Karen Ross. “The program is a triple win for California – it supports the health of our low-income shoppers, our farmers, and the local economy,” she said. This grant was awarded to the California Nutrition Incentive Program (CNIP), a new CDFA program that builds on the Ecology Center’s successful eight-year-old Market Match program. Market Match offers SNAP shoppers extra buying power when they spend their SNAP benefits on California-grown fruits and vegetables at certified farmers’ markets. Besides addressing food insecurity, the program boosts revenue for independent, small and mid-sized farms. Many of those farms are among the most innovative in sustainable agriculture. “Access to nutritious food is the foundation for good health. The healthiest choice should be the easiest choice,” said Assemblymember Phil Ting (D-San Francisco), author of AB 1321. “It will be exciting to see how these funds expand access to our state’s bounty by enlisting farmers’ markets in the fight against hunger and malnutrition,” he continued. This year’s state contribution of over $3 million in non-federal matching funds – made possible through Assembly Bill 1321 (Ting) – will profoundly affect the scope of the Market Match program. Until now, some farmers’ markets located in areas of high food insecurity have been unable to use the program; they tend to be small or volunteer-run operations without the capacity to offer up non-federal matching funds. “In a city as wealthy as San Francisco, it’s incredible that we still have neighborhoods that have little to no access to grocery stores with healthy food options, such as fresh fruits and produce, but we definitely do. Heart of the City Farmers Market has been incredible at creative ways of incentivizing healthy food choices through programs such as Market Match,” said Supervisor Jane Kim, who has helped secure additional funds for Market Match incentives since the program was first offered in her San Francisco district. The California state legislature voted last summer to allocate $5 million in state funds to establish CNIP; the bill (AB 1321, Ting) received bipartisan support and a strong endorsement from the Sacramento Bee. Now the investment is paying off, as the large influx of federal funds arrives in state. CNIP is made possible through a robust public-private funding structure—including the USDA FINI grant, state general funds, SNAP-Ed funds, and local partner support, comprised of private donations, grants, and in-kind contributions. “The state’s contribution to CNIP gives the program an incredible bump,” said Ecology Center Food and Farming Director Carle Brinkman. “Through CNIP, we will be bringing Market Match to 25 new farmers markets, and going deeper into high-need areas like Riverside County and rural areas like Siskiyou and Del Norte counties,” she explained. California’s SNAP program is the largest food assistance program in the country – about 10.8% of nationwide SNAP benefits are spent in the state. 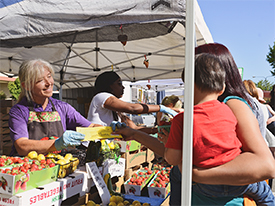 CNIP will offer nutrition incentives to SNAP shoppers at 339 certified farmers’ markets and mobile market sites throughout California. For every benefit dollar spent, these shoppers will receive an additional dollar of Market Match incentive that can be spent on fruits and vegetables at the farmers’ market. The FINI program debuted in the Farm Bill of 2014, which is slated to sunset September 30, 2018. More information on the California Nutrition Incentive Program can be found at cafarmtofork.com. For information about the efficacy of FINI grants at farmers’ markets, visit marketmatch.org/news. This entry was posted in Blog, Featured and tagged CalFresh, CDFA, Farmers' Markets, FINI, healthy food, Market Match, small farms, SNAP, USDA by Ecology Center. Bookmark the permalink. Wanted to know if you will be having the program again for test-driving electric vehicles? We will probably do another event, (this one was popular!) but none are scheduled at this time. Hit the subscribe button on our site to get our email EcoCalendar.